Pakistani human rights activist Nasreen Azhar, second left, addresses the audience at a launching ceremony for the report, 'State of Human Rights in 2018,' in Islamabad, April 15, 2019. Pakistan children sort through garbage for recycleable items to sell, at a dump in Karachi, April 4, 2019. 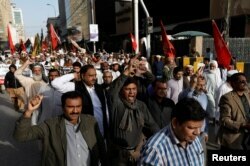 Journalists and social activists chant slogans during a rally protest which they say is against layoffs and the non-payment of salaries, in Karachi, Pakistan Feb. 8, 2019.